Sally is a fifty-something semi-retired wife, mother and soon-to-be grandmother living in the regional centre of Geraldton in the mid west of Western Australia. "I am a life-long advocate for a better humanity, and have been an activist for the environment and social justice since my teenage years," she said. "I have public sector management experience, and for the past 20 years have worked as a consultant in the areas of strategic planning, change management, organisational development, social planning (health, aged and community service sectors); and specialise in personal development and life skills training. I have been an elected local government representative, and have worked within all three tiers of government. I am passionate about equitable access to relevant and appropriate services for people living in rural and remote areas." I started writing this on Tuesday, March 18, 2014, on a flight home after attending March in March (MiM) Melbourne last Sunday, and MiM Canberra on Monday, March 17. I am still giving thanks, six days later, for the miracle that ensured MiM 2014 was a great success, that the vision I had for the marches became, in the main, a reality. Over 100,000 Australians marched in a collective, peaceful protest, with only one arrest reported. Magical. If people wanted this to happen, they would need to become involved: make the leap from ‘slacktivism’ as keyboard warriors to activism. On the night of Monday, March 17, I was confident a ‘Statement of No Confidence’ in the Abbott Government from the people of Australia would be read and debated in the Senate, having been presented to The Honourable Adam Bandt, MHR for Melbourne, the express purpose being a Senator asking leave of the President of the Senate for the document to be read in that house. 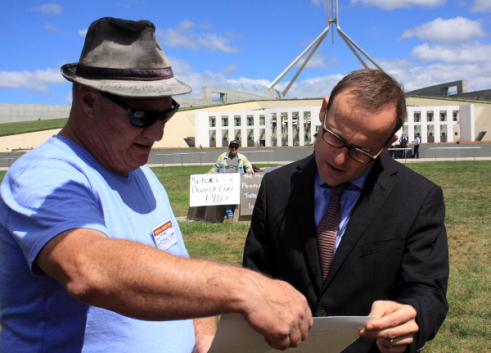 Loz Lowrey shows Adam Bandt the Peoples’ Vote of No Confidence in the Abbott Government (Photo: Wayne Jannson). Sadly, leave was not granted on a technicality. The document was not read and recorded into Hansard, although I have received assurances via Adam Bandt’s office that the document will be tabled once the archaic processes of the Senate have been satisfied, and the displeasure and lack of confidence of over 100,000 people in the government will be forever recorded as part of Australia’s political history. I very much look forward to this moment. The reason I feel so deeply about this is that I believe the very heart and soul of Australian society and culture is being ripped to shreds by a divisive, punitive government that has very little regard for anyone other than those of the ‘elite ruling class’, the ‘one percenters’ as they are commonly described. 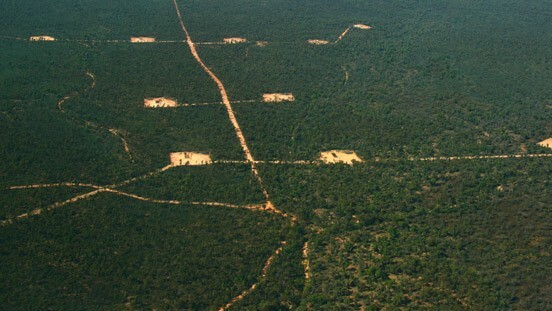 This trend was started very successfully by one of Australian politics’ most effective social ‘engineers’, former Prime Minister John Howard. He was able to subtly change the definitions of words and twist the truth, to feed peoples’ fears and create a big division within the people of Australia. The Rudd and Gillard Governments did very little to heal the division, and Tony Abbott was able to cleave the divide wide apart with his dismissive treatment of the vulnerable, and his complete disregard for the future of the planet and those who will inherit it. To me, the premise for this divide comes down to those who are open-hearted, caring and compassionate, and those who are not. Those who have regard for the good of the whole, and those who are motivated by self interest and greed. The MiM movement, over two successive weekends, in locations across the country, showed that around 100,000 people are prepared to show their open hearts, their caring natures and their compassion, and that the heart of Australia still beats. Towards the end of 2013 a Twitter account appeared – @MarchinMarch_2014 – and began garnering support for the idea of a protest march in Canberra in March, surrounding Parliament House. Some politically aware individuals on the progressive side of politics responded, and #MarchinMarch was used in tweets challenging or criticising the actions and decisions of the Federal Government. Things started to heat up in early January, with the Minister for Immigration and Border Protection, The Honorable Scott Morrison MHR, copping plenty of flack on the treatment of asylum seekers in offshore detention centres. Asylum seeker support groups were reporting that females in detention were required to queue and almost beg for sanitary products. The feminist activist group, Destroy the Joint, was calling for the women of Australia to take direct action by sending sanitary products to Minister Morrison’s office with words of protest. Tweets with photos of individual efforts were flying around in the Twittersphere on the evening of Monday, January 5. 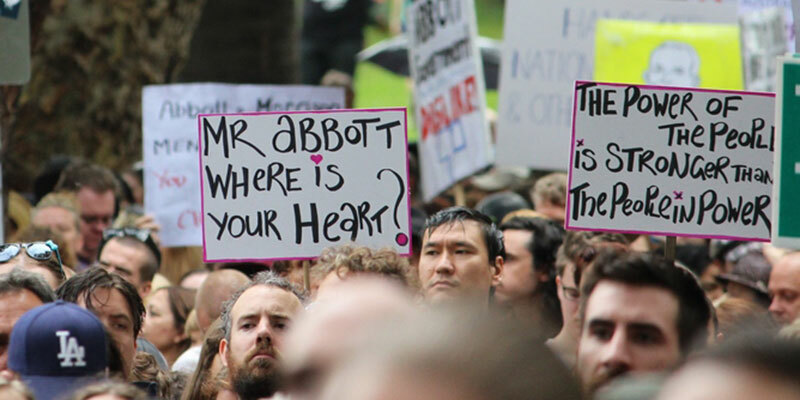 I was one of those involved in the action, and included the #MarchinMarch hashtag. There was no activity from the @MarchinMarch Twitter account, which was surprising given the level of disdain at the treatment of the women in detention. The owner of the account, @mffyrg, indicated he wasn’t able to proceed with organising the event due to unforeseen personal circumstances. A few people offered to do what they could – contacting GetUp was the first option identified. Those people were Craig Batty (@ABCJoePineapples), Tim Jones (@forthleft) and me (@Sally_Owl). It became clear on Tuesday morning that if the march was to go ahead it was necessary to start organising things immediately. Jan Mahyuddin (@j4gypsy) came on board to assist with this. The motivation for me to step up and become involved is the coming of my grandbaby in July, and the shame I feel at being associated with a nasty, horrible, mean Australia that will violate human beings for a few political points. The Rudd and Gillard Governments were pretty ordinary, but Abbott and his henchmen took disgusting to a whole new level. I experienced this shame first hand whilst I was in Europe after the Australian election last year, when people commented on how detrimental Australia’s policies are on the Global Village. A Facebook page was set up on January 6, to invite people to help and participate – true grassroots activism. People ‘liked’ the Facebook page in a trickle, which steadily built over the next few days. Many people wanted to march, however, very few were able to make it Canberra. As first organisers, we listened, and the protest was expanded to include capital cities. It was also perceived as essential that any march in Canberra had to be on a Parliamentary sitting day, so the politicians would be well aware of the protest, and some type of petition or statement could be delivered to Parliament on behalf of citizens everywhere who have been affected by decisions and policies, the lack of decency, integrity, transparency, regard for humanity etcetera. Making MiM a national initiative would make a greater statement of protest if there were coinciding protests in Australia’s capital cities. Regional people across Australia also demanded a right to protest, and the initiative was expanded to include regional assemblies. We organisers put out a ‘call to arms’ using social media – if people wanted this to happen, they would need to become involved: make the leap from ‘slacktivism’ as keyboard warriors to activism – making a direct physical contribution. People from across the country heard the call and came forward to do their bit. Many offered to help with their local marches and organising teams started to come together. One week into the campaign, numbers on the Facebook page passed 6000 and kept growing and growing, as did the number of regional centres committing to having a MiM event in their town. In addition to people offering to get off their butts and help out in a hands-on way, the encouragement and support of people came from across the social media. Increasingly there were numbers of people feeling empowered and hopeful, and wanting to participate. Maybe if we came together we could make some sort of difference, and demand a better performance from the government? March in March Adelaide (Photo: Trevor Worsley). 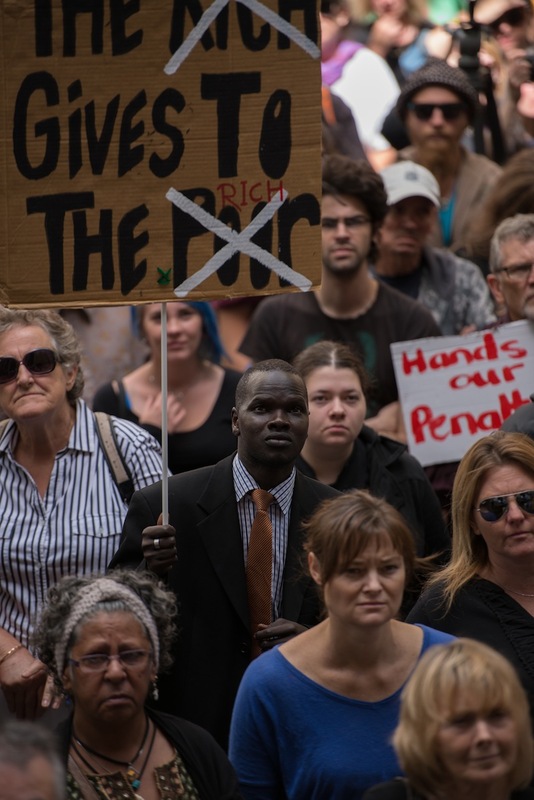 The catch cry became ‘Not in My Name’ – whatever terrible things the government was doing to asylum seekers, the environment, the workers, those needing welfare support, the education system, the health system, trade arrangements, foreign policy and so on, it was not being done in my name or the name of the many Australians engaged with the MiM initiative. It must be emphasised that all the people involved in organising MiM at the national level, and local organisers, were all volunteers. People with a range of skills made themselves available to support the four of us while we progressed this. Members of the core organising group indicated they were not aligned with, and did not have any formal associations with, any group or organisation relevant to the protest march. Whilst we had some skills and experience useful to this initiative, we were not professional organisers. At the local level, people from all walks of life came forward. Some were professional organisers in their day jobs, however, as MiM volunteers, they were acting as concerned citizens of Australia. Many had associations and affiliations with other activist and protest groups, unions, and political parties that linked them into broader networks to spread the word beyond the social media. Throughout the campaign, non-partisanship was paramount, as was non-affiliation with any organisation or group. There was also a consistent message of solidarity conveyed, in which all were encouraged to focus on shared concerns, rather than those where opinions differed. Most of all we appealed to the hearts of the 20 per cent of centrist voters who swung away from the progressive side of politics at the September 2013 election. About 14 days into the campaign, when I was confident that the concept had legs and a life of its own, I withdrew from the front line of the organising group. Having invested 224 hours of the 336 available to me in that time, I was mindful of not burning out. Most places had primary organisers in place, and the core group was starting to evolve to include some of these people, and others with specific skills: the national organisers group became Craig Batty, Tim Jones, Margaret McMillan, Leesa Little, Candace Wirth, Loz Lawrey and Chessy Collins. At this point I stepped back to mentor and support others, some of whom were participating in campaigning and organising for the first time. Jan also withdrew from the hurley burley at around the same time, to provide support in communications from backstage. I continued to mentor some of the organisers in strategy and assisted in the development of the documentation required for the events to proceed. A friend of mine was a conscious observer of proceedings, often highlighting gaps and deficiencies to be addressed to ensure success. I was able to feed this information back into the national organisers group so these could be dealt with to facilitate the events across the country. Many times in the past 10 weeks I have feared the whole thing might fall over – the phrase ‘herding cats’ was frequently bandied around as local organisers, other activist groups and organisations endeavoured to put their stamp on the event. There was also the challenge of people’s individual perceptions of co-operating with public authorities and law enforcement agencies, making for interesting dynamics. Public, tacit support came from journalists and bloggers who had picked up on MiM via Twitter. Jenna Price (@JennaPrice) and Victoria Rollinson (@VicRollinson) both wrote articles about two weeks into the campaign, which flagged it as something different on the political activist landscape. Leesa Little also wrote a blog, answering critics from the position of a MiM organiser. 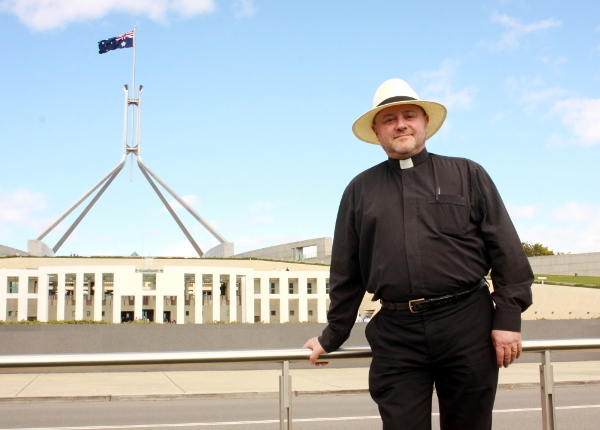 Fr Rod Bower strikes a pose before Parliament for NoFibs (Photo: Wayne Jannson). Around the same time, Father Rod Bower from the Gosford Anglican Church also showed support in his infamous signs, both encouraging us as organisers and appealing to the public to March in March. Margo Kingston (@margokingston1) also jumped on in a big way and provided a voice of commentary and assessment via NoFibs, calling for citizen journalists to cover local events. Much of the coverage now available is to the credit of Margo, the citizen journalists and NoFibs. The credibility of the MiM movement was under constant scrutiny as punters speculated on who was behind the group – the Australian Labor Party? The Greens? The unions? – sadly, not many were willing to believe that a group of ‘ordinary’ people with genuine grievances, fire in their bellies and dogged determination were driving this thing as volunteers, even though this was published repeatedly within the social media. Unfortunately, truth and honesty has long been a thing of the past in politics, replaced by spin and more recently outright lies. People seemed to not recognise the truth and preferred to distrust rather than believe. Putting on events such as MiM across the country requires money, and there were no large donors falling over themselves to chip in a few thousand. Many organisers were using their own funds in the early days, to keep things moving while a crowdfunding option was set up, and many are still out of pocket to the tune of several thousand dollars, after phone bills went through the roof, data quotas were chewed through at a rate of knots, photocopying of posters was done on home PCs for distribution, and working hours were reduced to accommodate the demands of MiM. Generous Australians made contributions via the crowdfunding options, and local fundraising activities were undertaken. Very early estimates indicated the whole national assembly of marches over four days in 32 centres cost in the vicinity of $14,000 – maybe the political parties could learn a few things about cost-effective campaigning, and the obscene donations from people wanting their backs scratched could become a thing of the past? 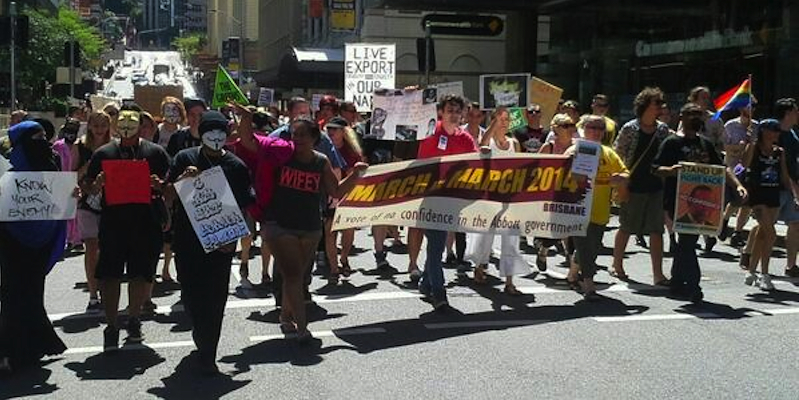 March in March Brisbane (Photo: Jan Bowman). Whilst I always had hope, there were times where my faith and trust were severely tested in believing MiM would actually move from a great concept to a brilliant reality. Volunteers in different time zones; family and work commitments; limited skill sets and experience; challenges with internet and phone services in regional areas; and a closed Facebook group as a meeting room should indicate complete and utter disaster to any rational person. Clearly, passion, commitment, determination and a willingness for a successful initiative had a greater influence overall. Therein lies the miracle – the heart did win out over the head – hopefully this is the beginning of a new way to do politics. Where it goes from here will be up to those like-minded people who showed the rest of their compatriots that Australia’s heart is still beating. Multinational corporations, oligarchs and their puppets in our Houses of Parliament haven’t killed it, and nor will they, it seems. I want to be able to look my grandbaby in the eye and tell them that their Granny did her absolute best to stop the rotten head of this nation from poisoning the rest. Not in my name it won’t. Thank you! Thank you for helping us find our hearts and our voices. Thanks to all involved in MIM. Your answer will be …. "I was at MIM". Sally Farrell – you are amazing – I had no idea how much you were involved in this amazing movement – you are an inspiration – you would have been really proud of young Rose she spoke with passion and compassion in her heart, I know there will be millions more at the next protest – the word is out now! MIM was an experience for me reminiscent of previous effective protests that actually made a difference. The moratoriums of the 70 ‘s the Workchoices rallies come to mind.My own daughters pride was strengthened as she attended her first protest and experienced the joy of participating in something good, just and worthwhile. Thanks Sally Tim and others, hopefully we can continue the movement and grow, attracting more and more people to get up out of that comfortable chair and inspire change and abolish appalling Govt’s like the Abbott regime with representative ones that have a moral compass. Congrats on a job well done . All we need to do now is each of us bring a friend to the next March and each contribute financially in some small way to relieve the burden on the few who have sacrificed so much for the greater good of us all. Only then will we drive the awful Tony Abbott and his awful cronies towards the obscurity and irrelevance they deserve. “We won’t remember them” and Australia will be a better place for that. I was proud to have Marched in March and am very grateful to those who have us ordinary Australians an avenue to express our frustration with our governments. I’m prepared to put my money where my mouth is and sincerely hope this is just the beginning. From one granny to another – you are awesome!! Thank you for doing what some of us can no longer do. Don’t you worry Ruth, your spirit, along with the spirit of many others, was felt. It is equally as important as the support of those who did manage to march. Thank you for being such a major influence in getting the March in March off the ground and on to fruition. I was so glad to be able to demonstrate my deep concerns about the direction the Abott government is taking this country. I sincerely hope there will be more marches only next time I may be in Darwin. As a side note, I have read reports of the MIM from cities and regional centres around the country but nothing about any such demonstration in Darwin – or did I miss it? Fantastic work Sally. I would add one perspective to your comments about those with open hearts and those without – I think you can also think of this as those who have learned that love is more powerful than fear and those who are still fearful – in my view, fear is what drives selfishness and greed. Fear of scarcity, fear of not being good enough, not having enough, not being important enough etc. We have all experienced this but some are moving towards greater love, it’s like a continuum. Susan, the biggest fear in this mess is xenophobia. I am proud that I marched. It was a wonderful revelation to see such a spontaneous, unspun, unbranded outpouring of genuine indignation at where we are heading as a nation. I marched in the rain in Sydney and the dog didn’t understand but she stood there patiently through the speeches from the heart and the wonderful Billy Bragg. Thank you, Sally for all you and all the others have done. Lovely to see social tech playing such as positive part. Love your work Sally, Craig, Margaret, Tim, Leesa, Jenna, Victoria, Margo, Plato and the rest of you. You have done a good thing. If there are still people out of pocket, I suggest that you set up another funding effort. I tried to contribute via the official method several times, without success. If there were glitches, could somebody sort them so we can contribute? Having observed the growth of the MiM on FB from its first days I must admit to being extremely impressed on how this has grown and matured. 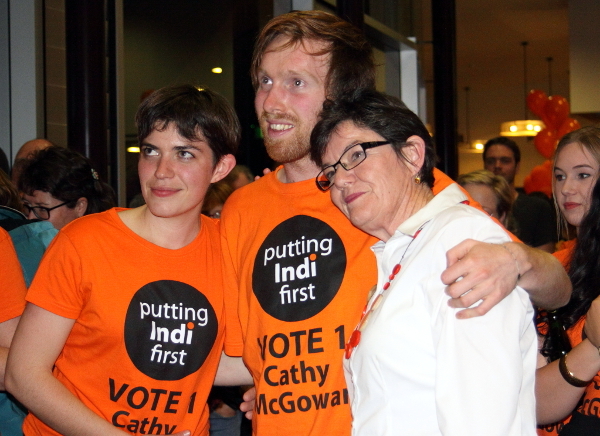 Until this came along I was one of the disenfranchised Australians who felt that their concerns were being blithely ignored by the present government, but as soon as MiM appeared on the horizon I was buoyed up with hope and with increasing amazement watched the growth as it spread across the nation. Democracy had finally returned to Australia and with the sight of the impressive turnouts at the diverse rallies I no longer felt alone and powerless. Yes this has made an enormous difference in Australian society and most certainly it will continue until our various grievances are given the proper respect and attention that they deserve by ‘our’ government. I sat on the executive for 6-8 weeks. I did the all the artwork with the “March in March” branding, helped design the logo with Craig Batty and encouraged the groups along. I was there a few days after the initial page was published. Many of my ideas and suggestions were adopted. And Mike Wilkinson, who was ostracised for voicing an opinion, came up with the “Not in my name” idea that was a huge success. We were instrumental in the success of MiM. Alas, our names do not appear in your story. I used Leesa Little’s blog and the about section on the main Facebook to get names as I did not know exactly who was involved in the National Admin group which formed after I had withdrawn from the coal face. My apologies for missing your names – it was certainly not my intention to omit or offend anyone. There are many many people who were instrumental in the success of MiM. Well done for being the torchbearer Sally ! I wasn’t able to do any more than keep clicking like but was certainly there always in spirit! 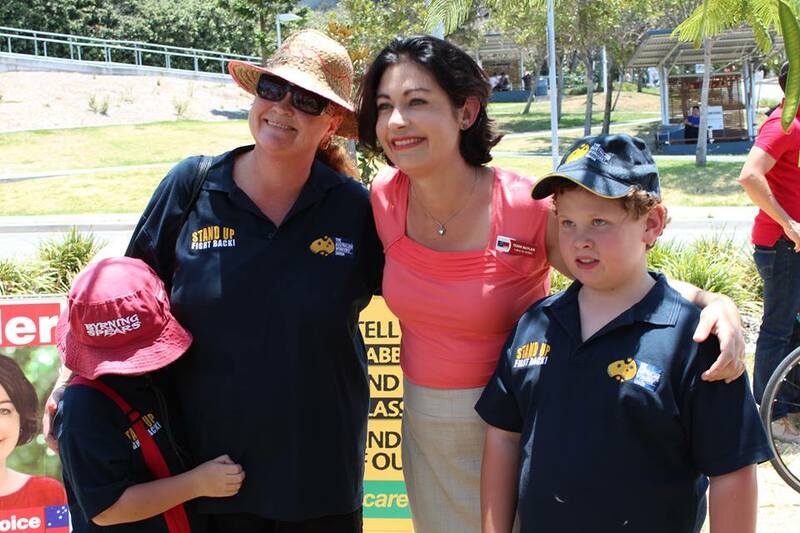 This movement is vitally important for Australia’s and our grand children’s future!